CP Lab Safety is certified "Green"! Maybe you’re carpooling to work. Or eating locally. Perhaps you simply turn off the lights and electronics when you leave the office. But do all these things really matter when it comes to making our Earth healthier and more sustainable? At CP Lab Safety we think they do. As a recognized Bay Area Green Business we strive to uphold environmentally sustainable business practices. That’s why we’re making a concerted effort to reduce our carbon footprint. In 2009 we returned our manufacturing from China to the U.S. resulting in more jobs in California and reducing the environmental impact our company creates during product shipping. In subsequent years we determined to take our Three Rs - Recycle Reduce Reuse seriously – so seriously in fact that we’ve reduced our waste by 75% -- by shipping our products in recycled boxes emailing invoices and offering our Catalog only online and on CD, not in paper. At CP Lab Safety you’ll find lots of natural light and high-efficiency fluorescent lighting. What you won’t find are electronics left on when we leave the office. We reuse what we can and recycle what we can't. "CP Lab Safety's dedication to the environment, safe water, clean air for workers and reducing their carbon footprint should serve as a model for businesses in the North Coast and beyond," said Congressman Huffman. "That's why I am honored to present this dynamic company with my Sustainable North Coast Certificate of Recognition for their dedication to environmental stewardship and sustainability. I thank CP Lab Safety for their exemplary green business practices and I look forward to seeing what they accomplish in the future!" CP Lab Safety became a certified Bay Area Green Business July 15, 2016 and continues to build on their environmentally sound business practices every day. 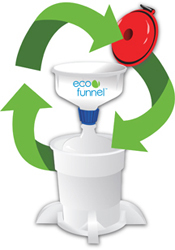 Go Green with ECO Funnels® and help eliminate toxic fumes in your environment!